The Forgotten Man is a sweeping title for a book about The Great Depression. Historian Amity Shlaes book was published just one year before The Great Recession of 2008 . Prescient indeed! Who is the forgotten man of The Great Depression? The Wall Street tycoon, the homeless, the apple vendor, the WPA laborer, or the woman in the most famous photograph of the period by Dorothy Lange titled Migrant Mother? In many respects the answer lies with none of the aforementioned. 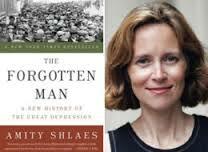 Shlaes makes the case that the forgotten man of the 1930s was those who today would be referenced as the great middle class. The parallels between The Great Depression and The Great Recession are enlightening and Shlaes places in historical perspective the lost opportunities of an entire generation of Americans, then and now. Surely this book is a study of the New Deal and what forms of government intervention did and did not work. Shlaes is certainly not a hero worshiper of FDR or of the New Deal but my take on this book is that it offers a balanced look at the multitude of factors surrounding Roosevelt, his advisors, detractors and the enormity of the recovery programs during the period. Most provocative and compelling is the insight and comparisons to the economic conditions in which the U.S. Economy finds itself today. The Forgotten Man of the 1930s is very much present in the displaced middle class of 2013. Is today’s forgotten man the family bread-winner out of work because of the government shutdown, the child in need of medical care, the returning veteran, the foreclosed upon and the forgotten? The similarities are ever-present. An aside from within The Forgotten Man is the startling comparison of how politically effectively FDR communicated the New Deal through the then new medium, radio, the 1930s version of today’s social media. Radio was FDR’s bully pulpit. A very interesting analogy. You may also wish to consider Shlaes Coolidge. ( see gordonsgoodreads ) While Amity Shlaes is certainly not a liberal, I think both The Forgotten Man and Coolidge are balanced. I would recommend reading Coolidge first. By doing so, the New Deal is placed in greater perspective. This entry was posted in Non-Fiction and tagged Amity Shlaes, FDR, Good Reads, The Great Depression, The Great Recession, The New Deal. Bookmark the permalink.